Good morning, crafty readers, Martina here with a breakdown of how I created one of the canvasses for the Imagination Crafts' show from Ally Pally. All the items sold out so quickly that I don’t think more than a handful of samples ever had the chance to be shown! Taking one of the larger canvasses, I coated the whole thing in Baltic Blue MDF paint. Once I decided on a rough position for my ‘torn’ section, I was able to start building up my canvas and forming the picture. 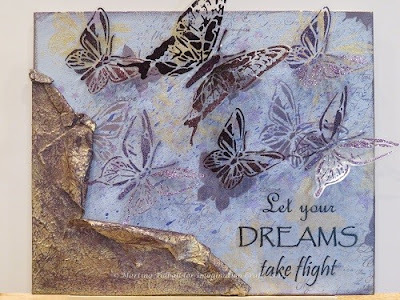 Taking script Art Stamp, I used Dark Orchid Starlight Wax directly onto the stamp and dotted it randomly around the whole area. 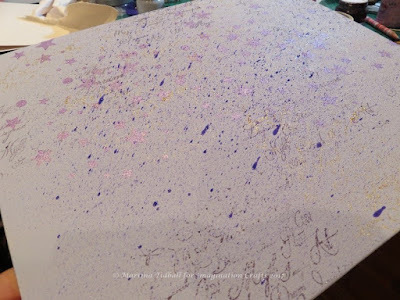 Taking the Large Detail Butterfly Stencil, I sectioned off a trail of the stars and spots and then used Island Blue Starlight Paint and a Domed Stencil Brush to add sections of these over the canvas. Light Purple Mixed Media Ink Spray and spritzed from that corner diagonally up the canvas. 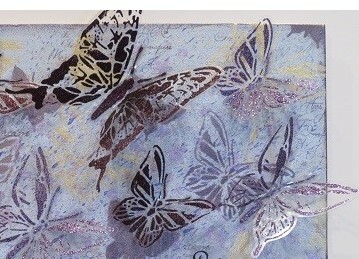 Turning back to my Detail Butterfly Stencil, I used some Dark Orchid and White Gold Starlight Wax to stencil different butterflies over the whole canvas. 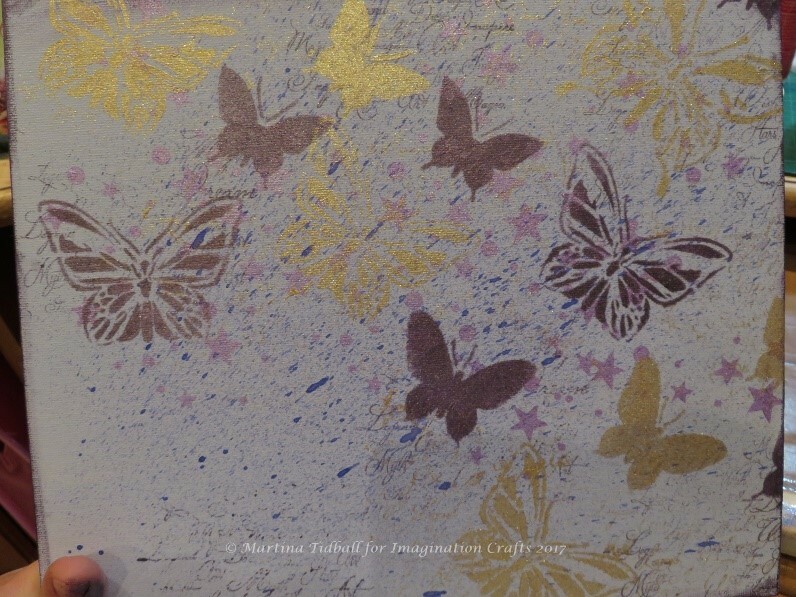 Whilst that was all drying, I wanted to create some flying butterflies for the canvas. 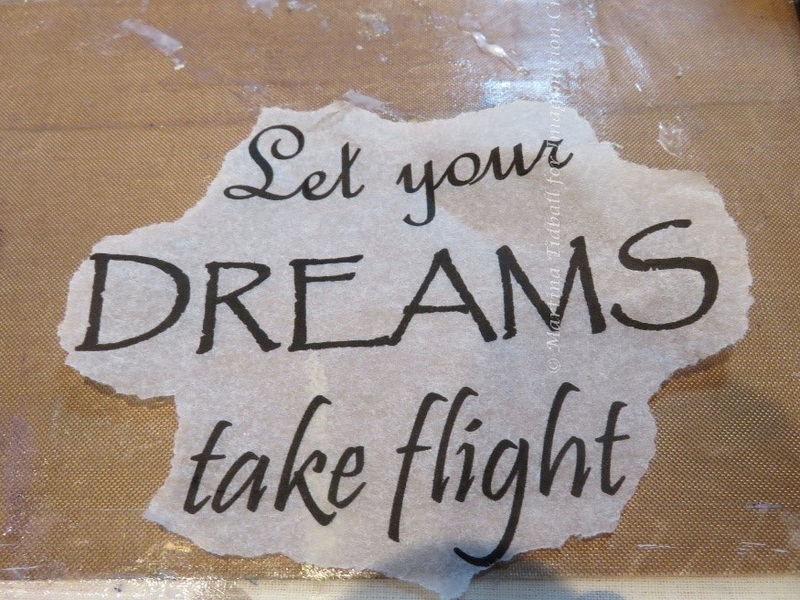 This time I applied Blackcurrant and Lavender Sparkle Medium through the stencil onto strong acetate. At this point I turned back to my torn corner. I used some strong mount board, tore it in the middle and folded the edges back to look as if they were peeling away. To keep the edges in place, I secured the card with strong glue. To make it all look more like an old box or fabric, I applied liberal amounts of Blanc Rusty Patina all over it. 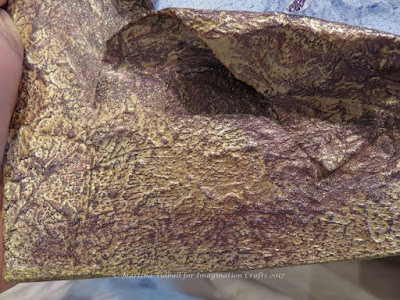 The texture of the Patina is amazing and gives such a rugged effect! As I had used so much product on this section, I put it all aside and left to dry for several hours. Magi-Bond Decoupage Glue all over. Turning back to my corner section, I painted the whole thing with White Gold Starlight Paint. Once dry, I used my finger to apply Dark Orchid Wax over the whole area and reveal all that lovely texture! I glued the corner into place and then to tie it all in I used White Gold and Dark Orchid Wax all around the edges of the canvas. With my butterflies cut out and applied, my canvas was all complete! It was one of those rare instances when what you visualise in your head actually does turn out as you planned! Yay! Happy crafting and I will see you again soon!